The Isetan Department store basement in Shinjuku has a remarkable whisky collection and sampling bar – a veritable wonderland for whisky afficianados. I was like a kid in a candy store however trying to find someone who could help was slightly challenging given my non-existent Japanese. Hence figuring out what I was potentially buying involved some guess-work. 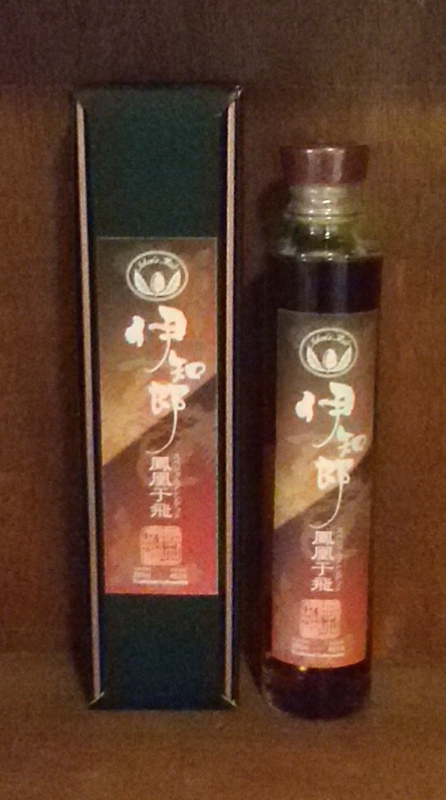 One goal was to track down something from the elusive discontinued Karuizawa, Kawasaki or Hanyu distilleries. Which definitely meant more carefully checking out the Ichiro’s Malt offerings as they astutely bought the Kawasaki and Hanyu discontinued stock. However… I’m not entirely sure if I succeeded in my mission! 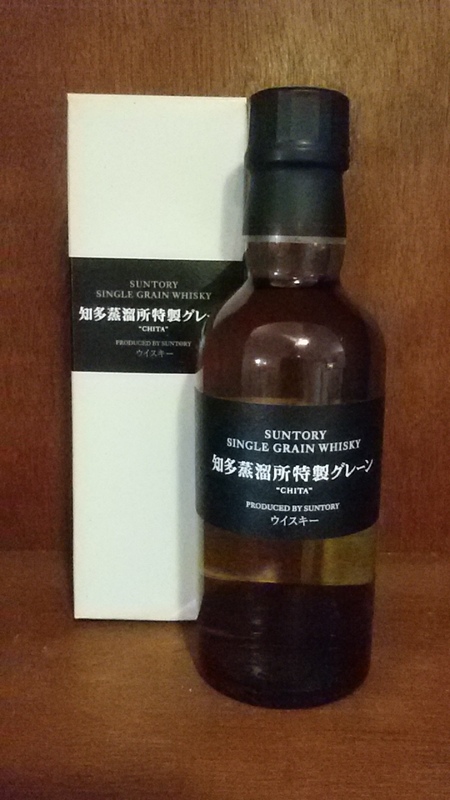 My best guess is that this particular whisky is a special bottling for Isetan using a blend of both rare Kawasaki whisky with Hanyu, sometimes found under the label ‘Houou-uhi’ (roughly translates as Pheonix). If I am wrong, I would very much appreciate being corrected and educated further! A grand dame in her full finery! Bottled exclusively for Isetan and, as far as I can tell, only available in its Tokyo Shinjuku store – or perhaps on auction? However I’m still not 100% certain we correctly identified it… The bottle I have does not state that it is a blend (whereas other labels do)… and the only number I can decipher in the notes is 30 (not the other years). 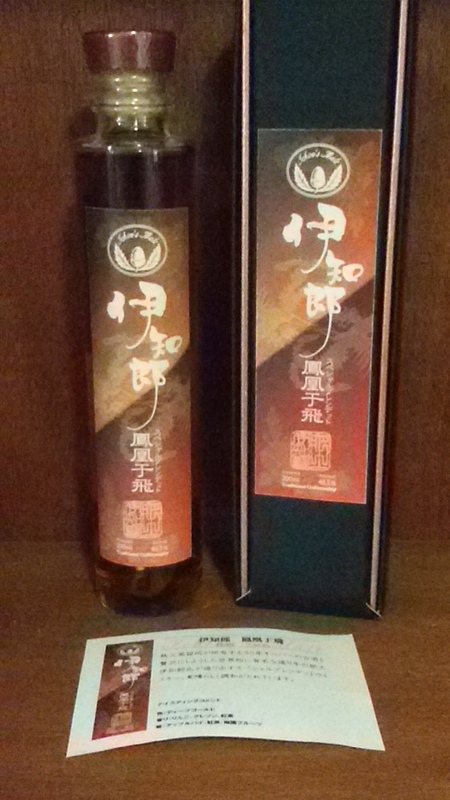 Despite several attempts, I cannot seem to find a combination of Ichiro’s Malt, 46.5% and 30 other than the Houou-Uhi blend! PS – A couple of us revisited it last night. Alas the delightful zesty lemon nose had evaporated. The sense of seaweed also dampened however there was more of a honey vanilla that emerged and the flowery perfume remained – I would still identify it best as jasmine. The cognac-like element was prominent, as was the oak. Some also described it as having a dark bitter chocolate quality. Key was unlike many whiskies that simply do not live up to their nose – this one absolutely does! Overall brilliantly balanced. Whatever this mystery malt truly is… if you spot it, grab it! 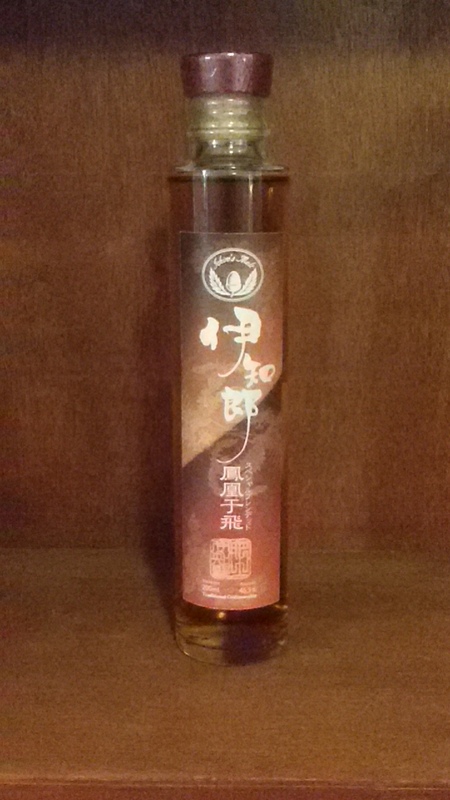 Whisky base with a Hanyu Houou-Uhi 12 year priced at Euros 599! We sampled this together with Suntory’s Chita Single Grain Whisky, Nikka’s Taketsuru Pure Malt 17 Year and Ichiro’s Malt Chichibu 2009 French Oak Cask as part of a Japanese themed tasting session held on 19 February and again on 26 February 2015. 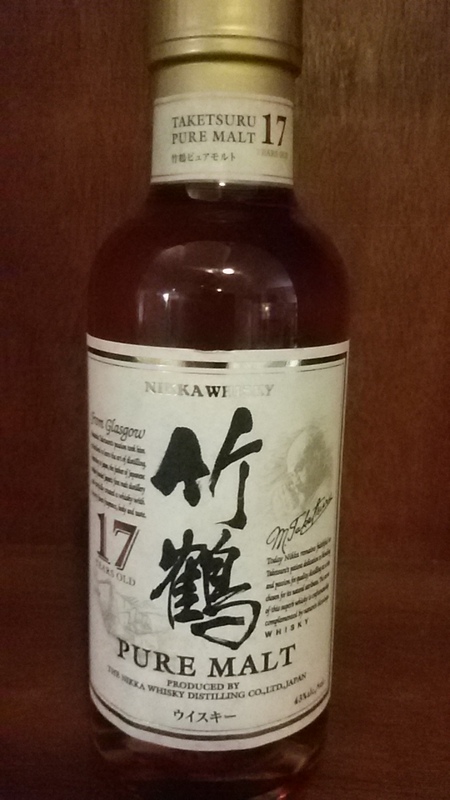 While more accessible than the others, I couldn’t resist picking up Nikka’s Taketsuru Pure Malt 17 year – largely as it came conveniently in a 180ml bottle! Nikka has quite smartly released a series of smaller bottles so us mere mortals without scads of money do not miss somewhat affordable sampling portions. It was voted the world’s best blended malt whisky in 2012 in 2014. So yes, I admit I was influenced in the purchasing decision. The real test, as always, comes when sampling ‘blind’. 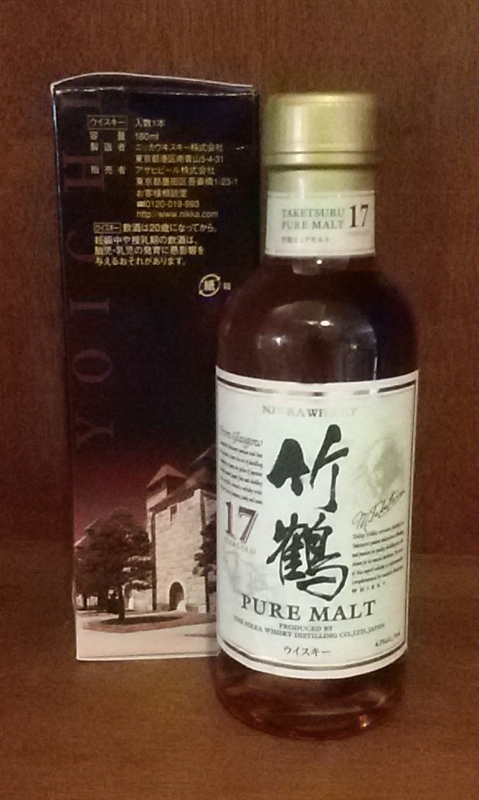 One member simply could not believe this was the same Taketsuru Pure Malt 17 year that is one of his favourites?! We seemed to have missed many of what this particular whisky is known for! How….? So we gave it more time to breathe, took a bit of a break and cleared our palates more fully with cucumber, unsalted bread sticks and water. Then tried again… Good thing we did! Finish – Impossible! It went from almost no finish to a delightful medium-long finish with impish spice and oak?! Order – Tasting order can hugely influence! Should have either tried it 2nd (which a latecomer experienced and loved) or taken a much longer break between tastings to clear our palate and minds of the Chichibu. Funny thing is I originally planned to have it 2nd then last-minute switched largely due to the Jim Murray review (last time I will let him influence!). Revisit – Very important to set it aside and revisit after time – it was like two different whiskies! Please oh please I beg you, give it time to open up with air for a half hour or so… Do not rush!! 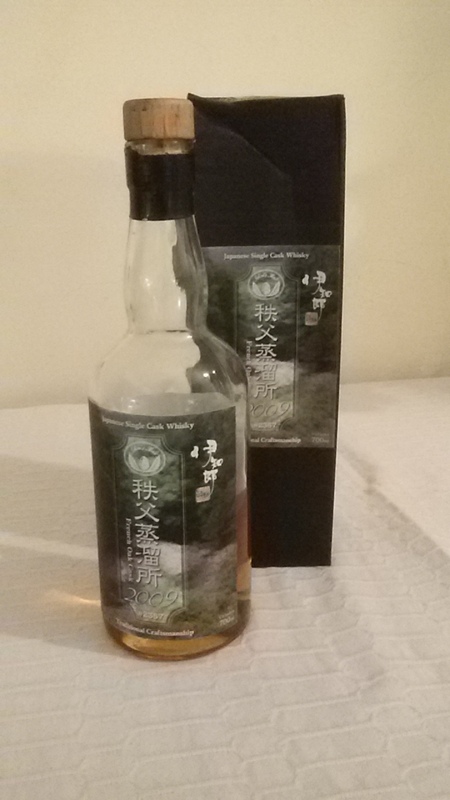 We sampled this together with Suntory’s Chita Single Grain Whisky 12 Year, Ichiro’s Malt Chichibu 2009 French Oak Cask and Ichiro’s Malt Houou-uhi as part of a Japanese themed evening in February 2015. I was in Tokyo for a few days in July 2014 for work – just enough time to both fall in love with the place and hunt down some interesting whiskies. 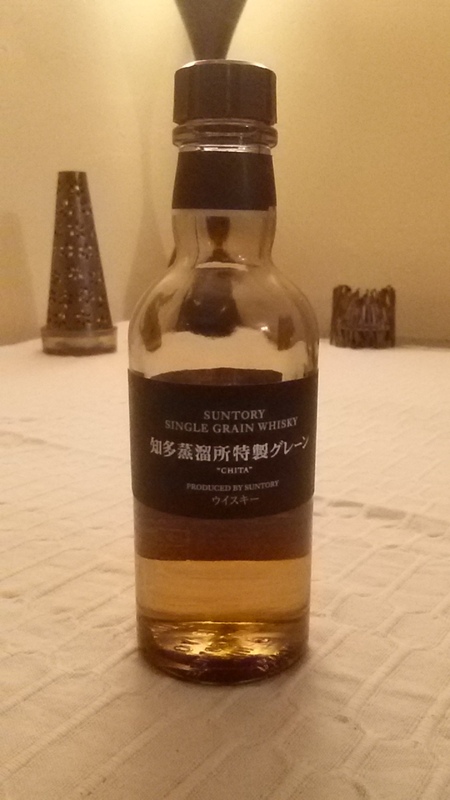 My quest was to discover whiskies less available outside Japan – and there was oodles of choice! Alas I was restricted in quantity – my next stop was Shanghai before Kuala Lumpur and then finally home to Bombay. The solution was to pick up a few sample sized 180 – 200 ml options and not restrict myself to the impossible choice of just one. When you think of Japanese blends, one that immediately comes to mind is Hibiki… And one of the key elements in Hibiki is whisky from Suntory’s Chita Distillery in Port Nagoya, Aichi prefecture, an area better known for its production of sake. I wasn’t sure what to expect of a single element of Hibiki however was sufficiently intrigued, it made the final ‘cut’ for accompanying me across multiple borders. After sampling it in this month’s whisky tasting session, I’m so pleased it did. Water? – One sacrificed to try however would not recommend adding even one drop! It is perfection exactly as is! Once the region was identified as Japan, one thought of Hibiki – and he was spot on! While not stated on the bottle in English, the Chita Single Grain Whisky is known to be matured for 12 years. Given its delicate character, one can be forgiven for initially thinking ‘youth’ however in truth it is deceptively mature with womanly charms. After our tasting, I began to think of the geishas of yore – trained in the arts not only of seduction but learned in all matters be it art, literature, dance, games, conversation… every detail refined with tremendous discipline behind its beauty and grace. 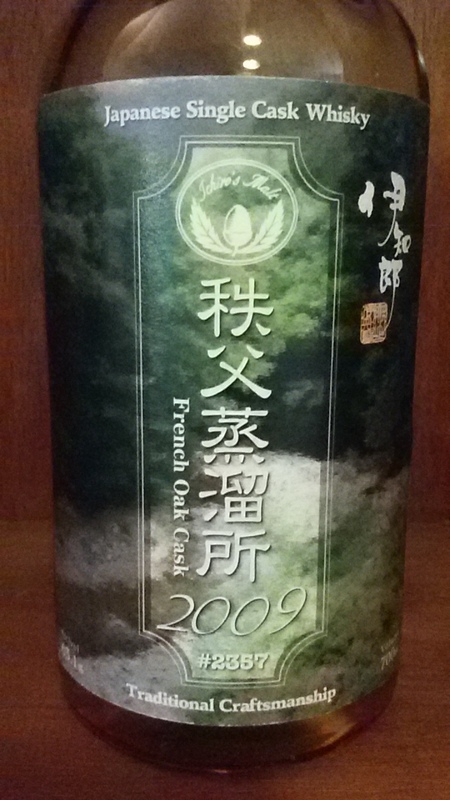 We tasted it together with Ichiro’s Malt Chichibu 2009 French Oak Cask, Nikka Taketsuru Pure Malt 17 Year, Ichiro’s Malt – possibly Houou-uhi. Final verdict? While I’m generally not known for enjoying ‘ladylike’ whiskies, this is such a unique approach I would love to have a full bottle gracing my whisky cabinet. Whisky Detectives – With extra points for including charming insights from their guest blogger Momoco with pics from her visit to the distillery! The more I explore the offerings from the independent bottler Gordon & MacPhail, the more I want to check out even more. 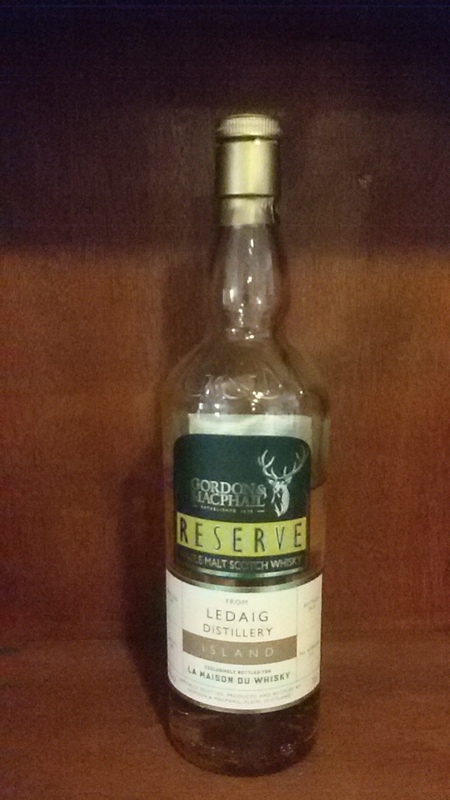 Ledaig is the peated line from Tobermoray distillery, the only distillery on the Isle of Mull. It was bottled for La Maison du Whisky and I picked it up during a rather enjoyable early evening in Singapore last year. Palate – After an initial punch of peat, hint of pepper, mellowed into a lovely elegant lady. The longer it aired the more notes discovered – fruit, more smoke, salty nuts, and more! This particular Ledaig was distilled in 1997, bottled in 2013 and is from cask no 462 with a total of 312 bottles. We originally tasted this whisky as part of our monthly tasting sessions on 17 June 2014 together with Tyrconnel and Talisker Dark Storm. It was definitely the whisky find of the evening. We had great fun with a guessing game of region, distillery… none came close until the hint was dropped that it is actually bottled by an independent company that specialises in bringing unique expressions and smaller distilleries whiskies to the world. I revisited this whisky again last month… and enjoyed it even more. A delightful dance on the nose and palate. All the earlier flavours brightened and matured. I added a dash of water and it ramped up the citrus, punched up the spice on the palate but dampened the smoke. Still lovely liquid gold but my vote is to go for it neat. Definitely a very special dram – one to savour! Many whisky distillers are chasing after that elusive ‘different’ element. Some succeed, many do not. 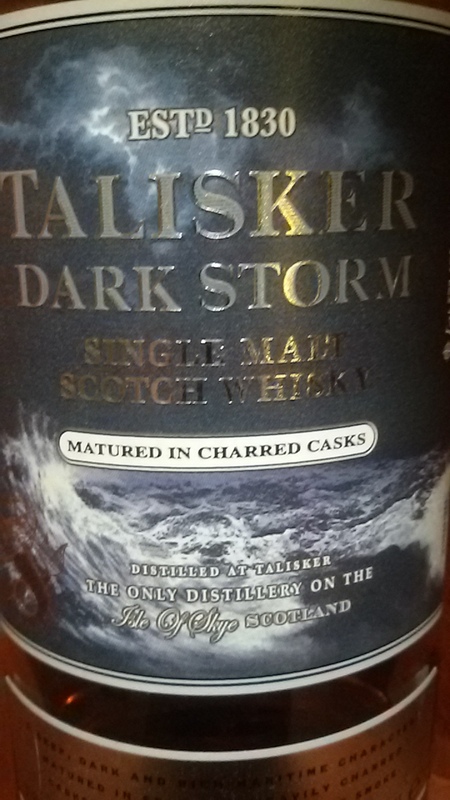 Talisker Dark Storm is the latest Duty Free release in Talisker’s efforts after Talisker Storm. Another thing we are learning is that the true test of a ‘good’ whisky is not in the initial impression… it is when it settles in… reveals another side… is revisited and even more nuances emerge. 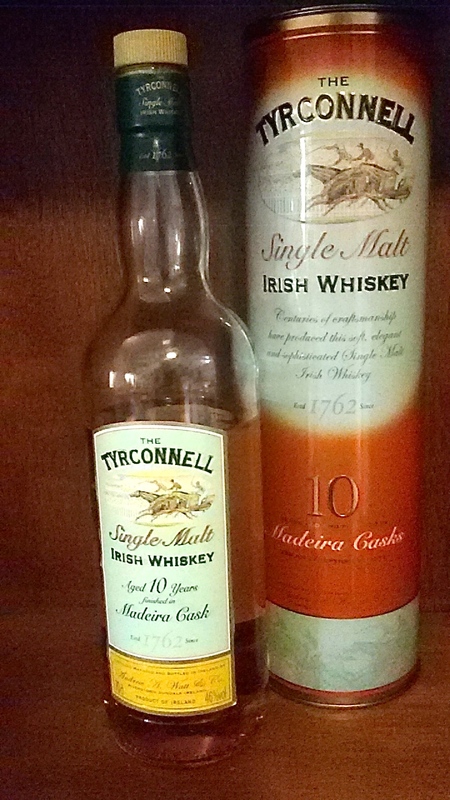 We originally tasted this whisky on 14 June 2014 together with Tyrconnell and Ledaig 1997. 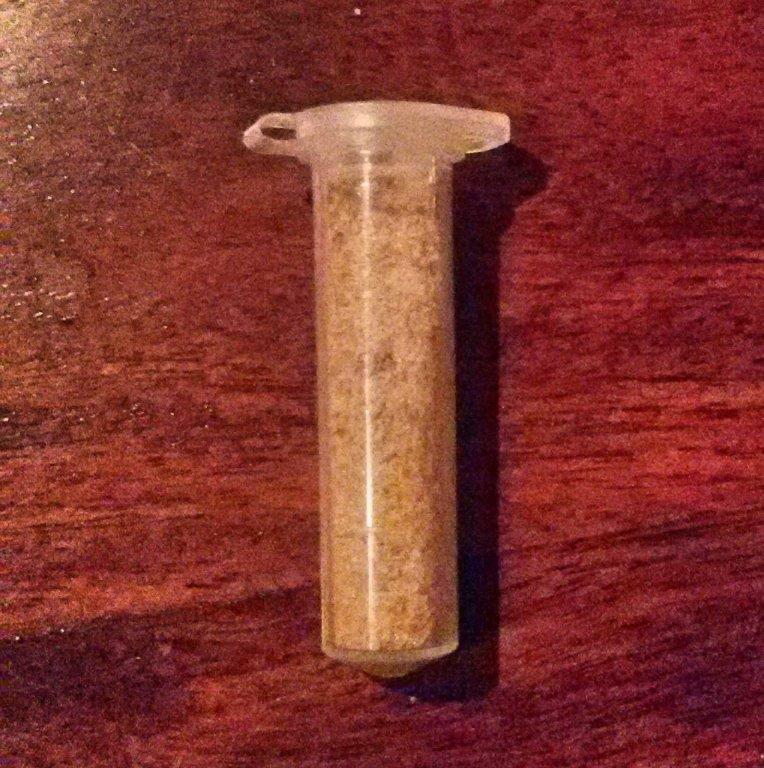 I re-sampled it in February 2015. The unveiling? Surprise! Most were not terribly impressed with earlier Talisker offerings… to learn this was duty-free, no age stated… and actually yummy?! Unlike the 1st tasting when the bottle was freshly opened and we quickly snipped, swished, savoured and swallowed, the 2nd round was slightly more leisurely and less complimentary. Did we get the same notes? More or less… the nose was exceedingly sweet, the medicinal taste seemed to have a vaguely manufactured quality to it. Same with the ash… which dominated both the palate and finish. The other elements seemed considerably more subdued, less nuanced the longer it had time to breathe. If anything, it became increasingly ‘flat’ like pop loosing its fizz. Yet the ash remained. Given the unrelenting ash element and the highlighting the charred oak casks (um… aren’t they all? 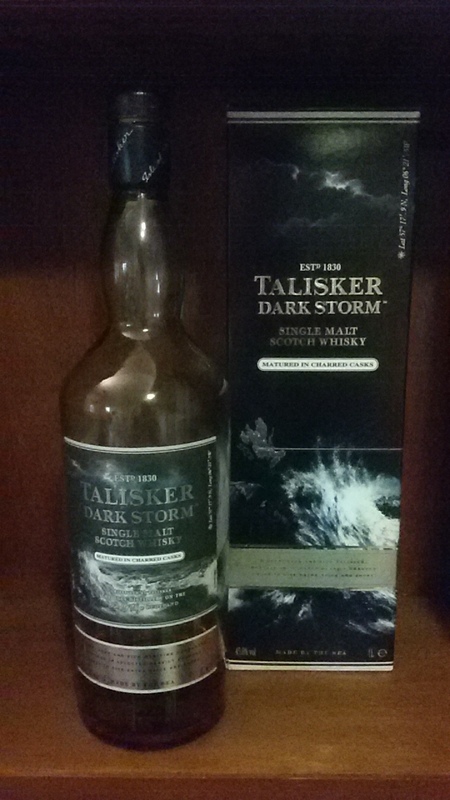 ), clearly Talisker achieved its aim of celebrating burnt wood. While certainly different from the Talker 10 year, it makes for more of a social gathering whisky than a top choice for an evening at home with a true whisky afficianado. 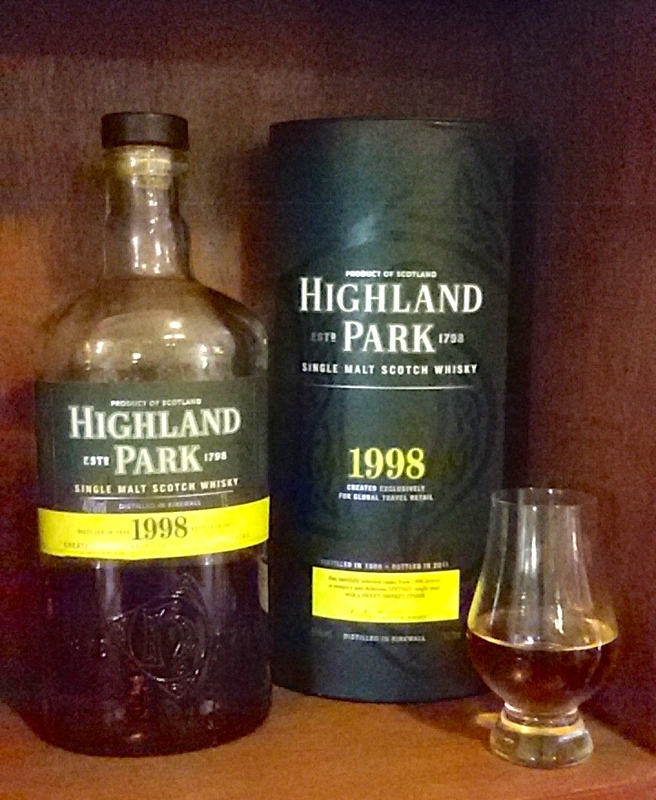 Relatively early in my whisky sipping days, I was introduced to Highland Park’s 18 year by a dear friend. It was one whisky I kept returning to savour and enjoy – most often with the very same friend. That whisky and I have some good memories. 12 year – Decent but for a few extra bucks, the 18 was sublime! And even 21 year – Superb but not my price range! Most important, the 18 year fit into my ‘pinch’ not ‘yeouch!’ pricing category and was easily accessible at Singapore’s Changi airport to grab when passing through en route home to Mumbai. And then the year based approach took over – bottles of this Orkney offering were found in labels of 1998, 1994 and 1990 – with a sharp price jump – especially the older options. Sceptical, I decided to start with the Highland Park 1998. 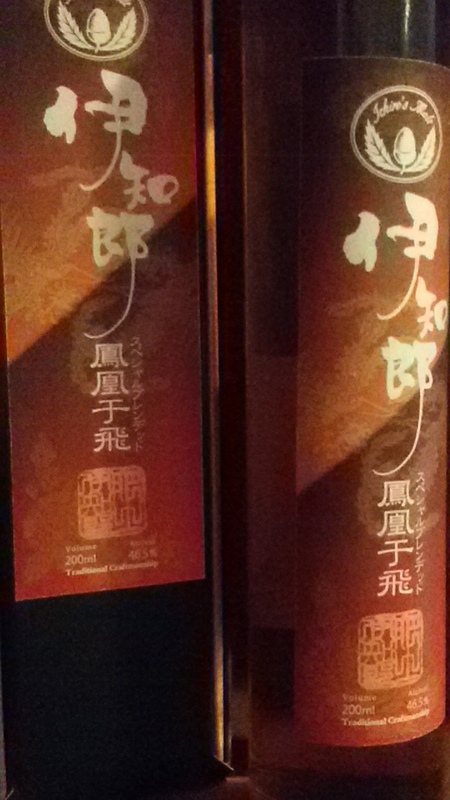 The one I picked up was bottled in 2011 – making it almost equivalent to the 12 year. I cracked it open, sampled and sighed… in disappointment. Not even up to my memory of the earlier 12 year. And here I will admit… I dismissed it, forgot about it. I didn’t even offer it as a sample at our monthly whisky sessions as didn’t think it worthy. It joined the league of left overs that would be available at social evenings for less discerning palates. However in dusting my whisky cabinet the other day, I decided to revisit. After all… it is not improving with age just sitting there and perhaps – just perhaps – I may have been a bit too harsh in my initial assessment. In fairness, one really should not rely on tasting from bottles opened ages (years!) ago. However while it still lacks a certain quality that makes a truly superb single malt such a marvel, it isn’t a bad dram. It just isn’t a particularly good dram. Perhaps I was just a wee bit harsh in my initial assessment. A little more info: Aged in sherry oak casks from Spain. According to the label, the colour is natural. PS. Interesting that most reviews seem to be of a version bottled in 2010 however unless the label on mine is a typo, it was a year later! I’m in a quandary… To open or not to open? 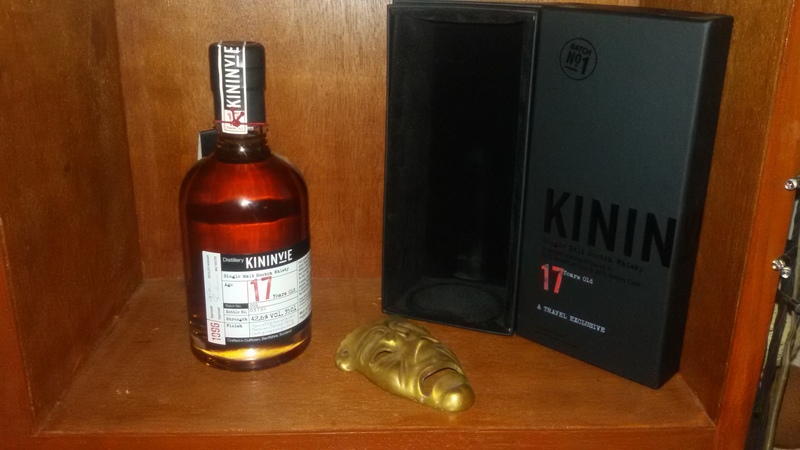 You see… on one of my many trips through Singapore in 2014, I splurged and picked up the Kininvie 17 year, batch 1. 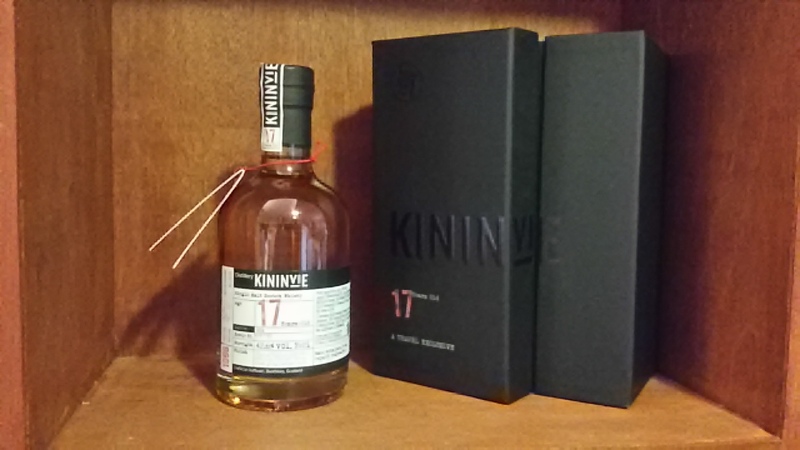 Kininvie is based in the Coeval hills of Dufftown – built on the Balvenie distillery grounds and best known as a component in the rather yummy Monkey Shoulder. While Grant & Sons are well known, having this particular distillery come ‘out’ as Kininvie is relatively recent with just the 17 and 23 year on offer. So… why not just crack open the bottle now and check it out? Well… you see… This particular bottle is designed to be ‘rare’ and if the initial reviews are any indication, may be worth hanging on to for a bit. Or perhaps it is just hype. I have never looked at whisky as an investment or something to ‘save’ for a later day. Instead whisky to me is a sociable affair – something to be savoured, shared and enjoyed with others passionate about such pleasures. So… what should I do? Open now or save? PS I finally did try it thanks to a sample from Whiskyrific! You can read my tasting notes here. In our journey to explore interesting whiskies, we often do more than just sample the whisky alone. In our January session, we started with a little experiment. 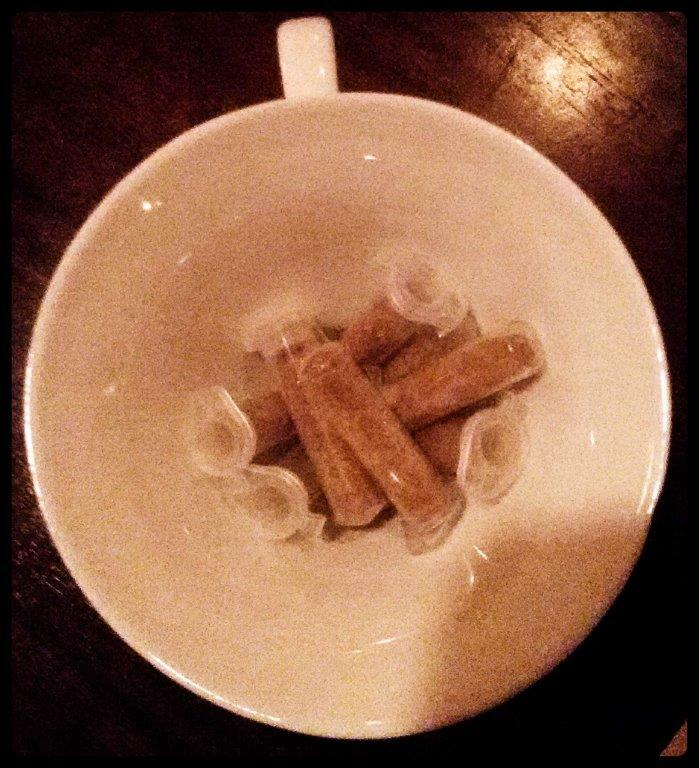 Our host reminded us that the sensory perception of taste is limited to just 5 – sweet, salt, sour, bitter and umami. He then instructed us to hold our nose, pop a powder from a vial into our mouth and taste it – still keeping our nose plugged. The immediate taste was sweet like brown sugar. He then requested we unplug our nose – instant recognition of cinnamon! Which was completely absent without the sense of smell. All this to remind us just how important the sense of smell is to what we perceive as flavours. So when we nose our whisky then savour on our palate, what we perceive as ‘taste’ is powerfully influenced by our sense of smell. Put another way… don’t waste good whisky by sipping it when you have a nasty cold!